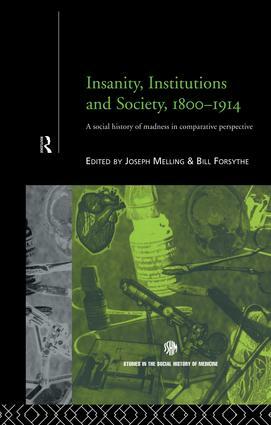 This comprehensive collection provides a fascinating summary of the debates on the growth of institutional care during the nineteenth and twentieth centuries. Revising and revisiting Foucault, it looks at the significance of ethnicity, race and gender as well as the impact of political and cultural factors, throughout Britain and in a colonial context. It questions historically what it means to be mad and how, if at all, to care. Len Smith, Birmingham; Peter Bartlett, Nottingham University; Pamela Michael and David Hirst, both at University of Wales, Bangor; David Wright, Nottingham University; Waltraud Ernst, Southampton University; Andrew Scull, University of California; Bill Forsythe, Richard Adair and Jo Melling all at Exeter University; Shula Marks, SOAS, University of London; Oonagh Wa;sh, University of Aberdeen; Lorraine Walsh; Jonathan Andrews, Oxford Brookes University; Akihito Suzuki, University of Tokyo; Hilary Marland, University of Warwick.